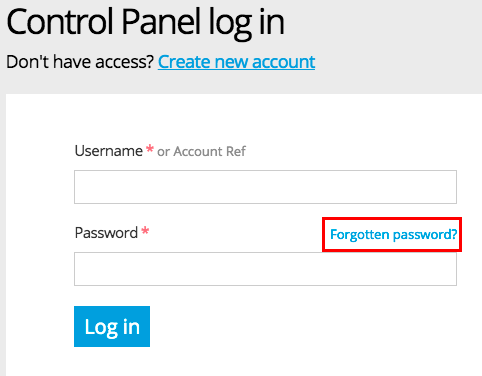 Its not a problem if you've forgotten your Online Control Panel password, as long as you have access to the email address registered to your Register365 account. 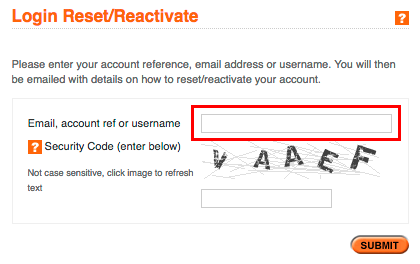 You will be taken to the Login Reset/Reactivate screen now, where you can enter either the email address registered to your account, or your account reference number. 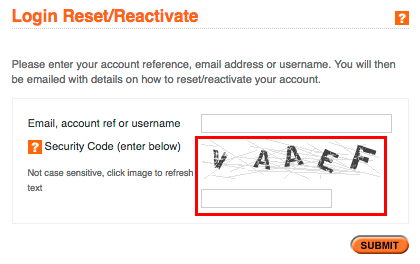 To complete the password reset step, enter the letters displayed on the image above the input field. Please note the letters displayed on your own password reset screen are likely to be different to the letters displayed in this guide. Once you have entered your details, select Submit. The system will then generate a link for you to reset your password. This will be sent to the email address registered to your account. If you do not use the link within 24 hours, it will expire, and you will need to follow the same process again. How can I reset my password if I cannot access my email address? If you no longer have access to the email address registered to your personal account, we will require you to either fax, or scan and email 2 forms of identification for the account holder, 1 of which must be a photo ID (new style driving license or passport) and a second piece of identification with your name and address displayed for example a recent utility bill. This must be accompanied with a signed letter giving us clear instructions on what needs updating. If you have a company account with Register365 and you cannot access the email address registered to your account, we require a fax or email, on company letter-head paper, displaying the companies registration number, and signed by a registered Director or Secretary of the company. Again with clear instructions on what needs updating.